Finding a name for your Boxer can be as easy as turning toward the breed's history. The Boxer originated in Germany and it is no surprise that many owners look for German names. Kaiser (meaning king), Klaus (short for Nicholas), and Leyna (meaning little angel) are a few popular choices. A good way to come up with ideas related to the Boxer's origins is to use place names in Germany. Saxony, Hannover, and Munster are just a few examples. A fun way to name your Boxer is to look up famous names in boxing. Good options include Frazier, Tyson, and Louis which are names from some of the greatest boxers of all time. Axel and Schenk are a couple of names taken from German boxing figures. the Boxer is a very stout and stocky dog. Perhaps the most popular names found amongst the breed are derived from their power and strong bite. Names like Jaws, Athena, and Tank are not at all uncommon. Some of our pages will contain a subcategory. A subcategory is a slightly more specific grouping than the main topic of the page. For a subcategory, we will include a separated table of names and corresponding descriptions. An example of a subcategory of Red Dog Names would be 'Dog Names Inspired by Red Wines'. 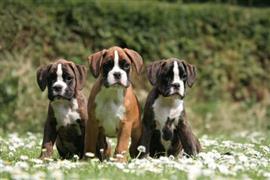 If you have any subcategory ideas for the Boxer Names page, we would love to hear them. Use the form below to submit your ideas.